In front of swarms of loyal fans who braved the freezing temperatures and sleeting rain, both the John’s XXIII College men’s and women’s soccer teams have triumphed in their respective Interhall Soccer Grand Finals. Having both been victorious in 2017, expectations were high. After taking an early 1-0 lead, the women’s side fought off a resurgent Griffin Hall who made numerous dangerous forays forward late in the second half. The John’s defence stood tall despite the stern opposition and horrendous conditions to secure an impressive victory. The men’s contest was incredibly hard fought. The dark grey clouds parted following the relatively uneventful first half and made way for an energetic second period. A sloppy piece of defence produced a clear opportunity for John’s, which was clinically finished, putting the reigning premiers 1-0 up early in the second half. Following numerous counter-attacks, a determined Fenner Hall side finally broke through to level the scores with 10 minutes to go, after a deflected clearance fell into a dangerous position just outside the John’s defensive box. Only moments later, in almost identical fashion to the first goal, Fenner’s defence was caught off guard following an ineffective attempt to clear the ball and the Fenner Hall goalkeeper was left helpless as John’s again hit the front. Despite some intense final moments, an impressive John’s side managed to hold on for an impressive victory. A cold and dreary Thursday afternoon set the scene for another edition of one of ANU’s time-honoured rivalries. Following their AFL triumph last year, John XXIII College celebrated a repeat of their 2017 success, dominating a tenacious Burgmann side en route to an impressive victory. 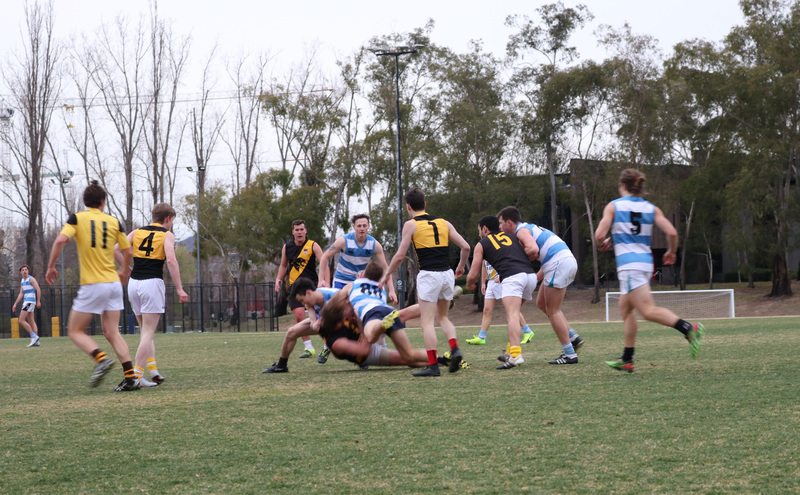 Last week, John’s was able to maintain their undefeated 2018 AFL campaign, comfortably disposing of a much-improved Fenner Hall side. Burgmann booked their place in the grand final in a narrow victory against a depleted, but resilient Burton & Garran Hall. South Oval’s western boundary was three or four deep in some places and the resulting atmosphere was raucous and electric. Every contest was accompanied by fierce cheering and the passion was palpable. The first quarter resembled the tight arm-wrestle many expected. John’s dominated possession, field position, and contested footy early, but the stout Burgmann defence limited the damage to just a one-goal deficit going into the first break. John’s were unable to replicate the free-flowing style which defined their victory the previous week. John’s midfield dominance continued throughout the second and third periods, consistently beating their Burgmann opponents in the contested football and spread from contests. However, Burgmann’s defence continually frustrated John’s forwards, limiting the scoreboard impact of their dominance. The Burgmann forwards capitalised on their finite chances, but still trailed 3.2:20 to 7.2:44. Despite a clear rise in intensity, Burgmann was unable to mount what would have been a momentous final quarter comeback, and eventually, Johns cruised to a comfortable victory in front of a swarm of fans. 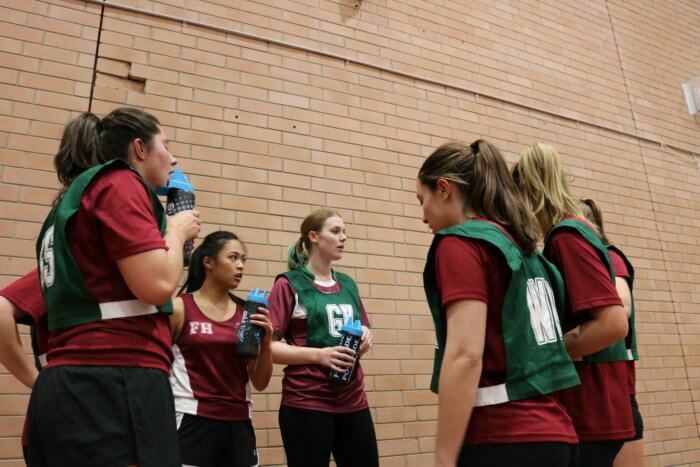 The conclusion of the Interhall Division 1 Netball Competition played out in dramatic fashion, as the Old Sports Hall hosted a ferocious encounter between Fenner Hall and reigning netball champions, John XXIII College. The tense contest lived up to the expectations of the 50 deep crowd, which lined either side of the court. Having conquered their John’s opponents a week earlier, the Fenner side led by Tilly Clark and Lara Parmenter felt confident that they were good enough to come out on top. Following a frantic first half, the sides were locked at 15 points apiece. The tightness of the first half continued early in the second, before a John’s player recklessly kicked her opposing number, resulting in her expulsion from the game, and subsequently leaving John’s with only six players for the remainder of the third quarter. Fenner capitalised on their under-manned opponents, running out to a 27-21 lead at three-quarter time. Fenner’s imposing lead materialised as a hurdle too large for a tired John’s outfit, as the ‘Rabbits’ held on to record an impressive victory over last years’ champions. Coach Tilly Clark emphasised how important the third quarter was to her side’s success, highlighting Fenner’s ability to convert “turnovers into goals” as the catalyst for their success. Fellow coach Lara Parmenter reaffirmed that Fenner’s “dominant” last quarter in their regular season clash against John’s gave her confidence that Fenner had the quality required to win. Their victory today caps off a meteoric rise. Fenner Hall failed to win a single match in 2017, relegating them to the bottom of the eventual standings. Coach Tilly nominated “great first years, coming along and having a go” and “consistent training” as the nucleus of Fenner’s leap from last to first in 2018.